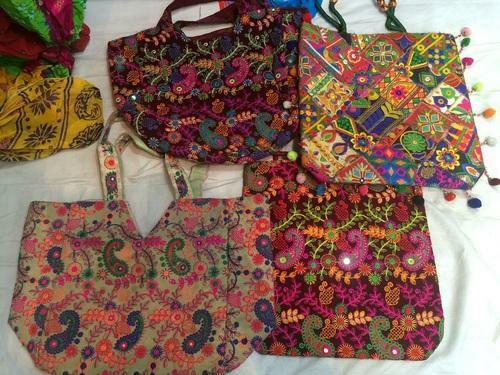 These Gypsy bags are durable in nature and made in Gujrati Embroideries varied eye-catching colors and designs. Our entire product range is tear-resistant in nature and is extremely light in weight. We deliver the entire product range as per the preferences and repetitive orders of our clients. Moreover, we offer them in many shapes and at most affordable rates. Backed by a dexterous team of creative designers, we have been able to offer an excellent variety of Apparels, Accessories and Home Linen for the past 9 years. Our product range includes Hand block and screen printed Fabrics, Kids Wear, Infant Bedding and accessories Women Wear,Home Linen and much more. Intensive network for quilting and other types of hand work. These are known for exclusive features like durable finish standards, superior quality, attractive designs. All the mentioned products are designed and manufactured by our professional experts. They manufacture each product as per the international quality standards. Moreover, the entire range of products are tested on well defined parameters that include texture, shrinkage, printing, fabric dyeing and product packaging. We make the final deliveries only when the consignments are quality approved and ensure that these are reached to the clients location within the stipulated time limit.